The gleaming white trains at the Dallas Zoo are some of the most attractive ones I've ever seen. The rider sits facing the left side of the train's forward motion, all the better to ignore the outside world, which is always at the rider's back. 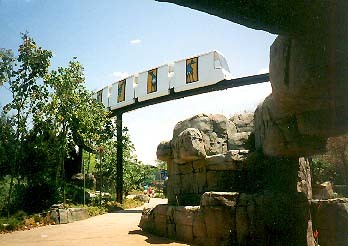 On the left sides of the trains are geometric African designs, and on the right the doors are decorated with animals for which each of the trains is named (Elephant, Okapi, and Leopard). 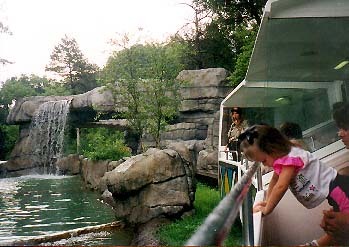 On the Wilds of Africa Monorail Tour, riders can view 31 species of animals during the twenty minute ride. According to Monorail Supervisor LaVona Purcell, plans for two new Von Roll trains are on hold for now. During my front cab ride with my "Monorail Guide" Jennifer, she spieled and pointed out the various animals while wearing a Mickey Mouse watch--is there no escape? Von Roll seems to need no help in selling their transportation monorails, since several systems worldwide are in operation or being constructed, as well as those that have been relocated from the various Expos that the Swiss manufacturer has serviced.